Consumption of beer in Germany, which has been progressively waning over the last decade, was a tad lower again last year, official data pointed on Monday. 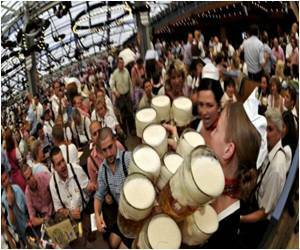 The federal statistics office Destatis calculated that German breweries sold a total 98.2 million hectolitres of beer in 2011, 0.1 percent less than in 2010. Domestic beer sales were down 0.8 percent at 82.7 million hectolitres, while beer exports increased by 4.0 percent to 15.5 million hectolitres, Destatis said in a statement. Just over a decade ago, in 2000, overall beer sales amounted to 109.8 million hectolitres and domestic beer sales to 98.8 million hectolitres, while beer exports stood at 11.0 million hectolitres. The personality type, the kind of friends a person keep can be determined by the brand of beer they drink, shows research. Reports say Malaysian Home Minister Hishammuddin Hussein has 'cleared' the Prisons Department to cane part-time model Kartika Sari Dewi Shukarno, who is being sentenced for drinking beer. Britons may soon drink more beer at home than in the nation's cherished pubs, The Daily Telegraph newspaper reported Monday, with one industry body blaming the supermarkets for undercutting them.